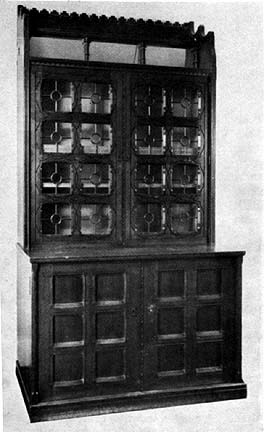 Oak, with incised and inlaid decoration, glass doors, a mirror in the top stage, and brass mounts. The lower stage contains fifteen drawers, the upper shelves. On the upper edge of the lower right-hand door is stamped 'HOLLAND & SONS'. Date: 1865. Simon Jervis. "Holland & Sons and the Furnishing of the Athenaeum." Furniture History 6 (1970): 48.